Are you a salon owner? Cosmetologist? Hair Blogger/Influencer? Do you happen to have a ton of social media followers and/or clientele? Private labeling might be the way to go if you’re looking to increase visibility within the beauty industry and generate more revenue. 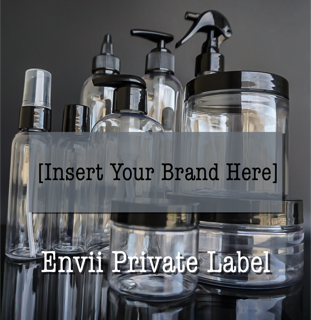 Private label is a product manufactured by a contracted manufacturer such as Envii Haircare. The products are sold under a retailer’s brand name. As a retailer you have the ability to choose the ingredients, determine how it’s packaged, what the label looks like- and pay to have it produced and delivered to your door. The term “private” refers to the confidentiality that is between you and the manufacturer. Have you ever purchased a store brand product (i.e. Sephora, Target or Walmart)? Most items that are purchased have been private labeled. This is why developing a brand that is unique to your client base is a huge step to increase overall success within the industry. The beauty industry globally is a billion dollar industry. Expansion is optimal for even the smallest of salons and stylists. Creating a private label brand, sets your business apart from the competition. Your brand of products will only be sold in your salon or marketplace and not through unapproved channels. The use of private label formulas are generally less expensive than spending $1000 to $1500 (minimum) to formulate a product from scratch. That cost doesn’t include producing batches for you to sell or distribute. Choosing a private label formula, gives you the ability to negotiate to purchase it either in stock packaging or provide your own. Creating formulas from scratch takes a tremendous amount of time and money. There are stability issues, raw material suppliers to be found and negotiated with, packaging to be tested and so much more that goes into creating a formula. In addition, you have to be sure that your formula complies with all FDA regulations. A private label formula has already gone through all the necessary details. With competition in the beauty industry being at an all-time high. You set and control the price your products sell for. This allows you to make a greater return on investment. As a stylist, clients will purchase products from your salon in order to maintain and or achieve the style you provided. Having a product line branded by you and for you will keep clients coming back, which boosts demand. IT’S YOUR NAME AND YOUR LOGO! You have the ability to showcase your products at expos, hair shows and much more. Promoting your brand will give you greater visibility and brand-equity. Clients come to you because you are great at what you do. Having your own brand will increase your level of credibility. Clients will hold your brand to a higher authority. Having your own hair care line will increase the client retention because they want what only you can provide. Your services and products will merge into one. No more selling and advertising other names. You’ll be able to take the same effort and use it towards advertising your own. Maybe you don’t want to style hair or own a salon for the long haul. Even if you do, creating a brand and image for yourself will give you dividends for years to come. How nice will it be to make money while on vacation or while away from the salon? Your products can offer that residual income. Are you interested in learning more about building a hair care empire of your own? Visit Envii Private Label to learn more or give us a call at (713)702-8187 to speak with us. Very interested more info please also info on pricing. I will love get some information. I read in the FAQ that you do not do the labeling anymore. So basically I would pay to receive your product bottled up or by the gallon. I would then need to find someone to do the labeling? I assume you dont do drop shipping on private labeling only if I am a distributor through your company correct? Do you still produce the labels ?? Hi can you email me a Price list ? Hi ! Do you do special designs ? I would like to purchase product with a label but I doesn’t want something someone else has! I am interested in private label for my hair products. I am just starting out and do not having a following. I only sold to friends and family and posted about it once late winter early spring. Hello I wanted a wholesale price list. Can I get a sample of the hair gel, I’m a barber and have a barbershop. I’m already sponsored by a gel company name MOTIV but want to do my own hair care line, can u please help?